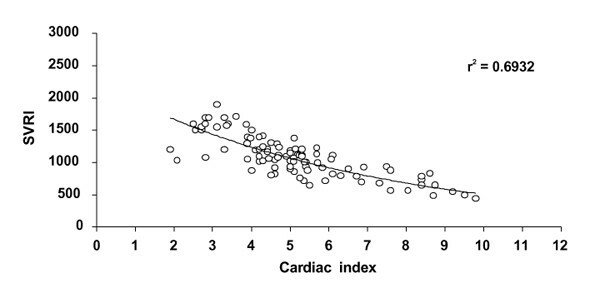 High cardiac index (CI) and low systemic vascular resistance (SVRI) are frequently observed in septic patients and are essential in consideration of further therapeutic interventions. As these findings could be observed even in healthy individuals (i.e. during hard exercise) we decided to analyse the relationship between CI and SVRI in patients without apparent clinical signs of the inflammatory response and in patients with the different phase of the inflammatory response. Thirty-one critically ill patients with pulmonary artery catheter inserted were included in this prospective study (average age 48±16 years, average sum of SOFA score 2.4±1.36, etiology: 60% traumatic patients), all of them with apparent clinical signs of the inflammatory response (heart rate >90 bpm, WBC >12000 or <4000, BT >38ºC or <36ºC, CRP >50 mg/l) with microbiologically confirmed infectious etiology. In accordance with our findings (published in Int Care Med 1997, 23(Suppl.1. ):S72) we identified 16 periods of generalization of the inflammatory response (fall in platelet count, antithrombine-III activity and serum albumin, positive fluid balance, hemodynamic instability). Within these periods, 101 hemodynamic measurements were performed, measured parameters are shown in Fig. 1. In periods without symptoms of generalized inflammatory response we performed 115 hemodynamic measurements, results of which are shown in Fig. 2. 130 hemodynamic measurements in patients without apparent clinical signs of the inflammatory response (25 patients, age 51±17 years, pulmonary artery catheter inserted in setting of preoperative hemodynamics optimization) we used as the control group. Results are shown in Fig. 3. The relationship between CI and SVRI shows a different course in the phase of the generalized inflammatory response compared to the phase of the localized inflammatory response. The course of the relationship between CI and SVRI in patients without inflammatory response is nearly identical to that in patients with symptoms of the localized inflammatory response. On the basis of these findings, we presume that assessment of the relationship between CI and SVRI (but not isolated CI and/or SVRI) is needed for accurate therapeutic decision making.